The Britax Click and Go Receivers for B-Agile Double allows you to smoothly connect compatible infant carriers onto your stroller. Britax B-Agile Double Pushchair is an ultra lightweight twin pushchair at just 13.2 kg and offers some great features. It's proof that side-by-sides can be streamlined too, as two can travel as comfortably as one. Why should I choose the Britax B-Agile Double Pushchair? The Britax B-Agile Double Pushchair is suitable from birth to 15kg (or approximately 4 years old). Its aluminium chassis makes this pushchair very lightweight. 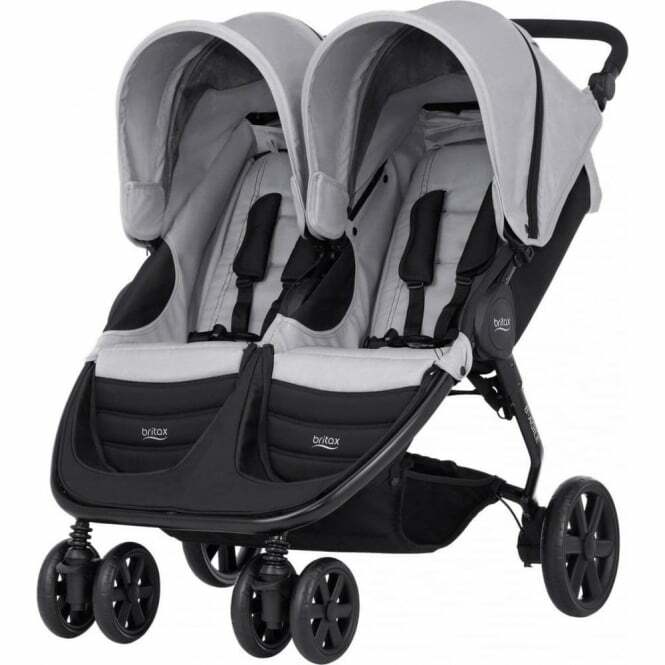 Plus, the built in suspension ensures that your bubba's will always experience a smooth ride. This smart double pushchair features a height adjustable handle which can be easily and effortlessly steered with just one hand. As well as this, newborns will be as comfy as can be in this pushchair due to the lie-flat recline position. If you want to add a carrycot into the mix, you can! With the addition of two Britax Soft Carrycot's, you can lie two little pea's side by side whilst you stroll. Perhaps you have a Britax Baby Safe Car Seat? This can be easily attached to this pushchair, forming a pushchair travel system. All you need is the Britax Click and Go Receivers for B-Agile Double! The lockable front swivel wheels help make steering a breeze, too. Then when you're all ready to pack it up and put it in the boot- An easy one-pull fold with an automatic fold-lock makes the Britax B-Agile Double Pushchair effortless. Plus it's freestanding when folded. Your little ones will be safe in the 5-point safety harness with height adjustable shoulder straps. As well as this, Britax ensure that you're comfortable whilst pushing the soft padded handle bar. This twin pushchair features a large storage pocket in the canopy and a spacious shopping basket, which gives you plenty of room for supplies. If you want an even more compact fold, this Britax pushchair features quick release wheels. Last but not least, the tyres are puncture resistant, and ready for all terrains. What are the specifications for the Britax B-Agile Double Pushchair? Is there a Manufacturers Warranty for the Britax B-Agile Double Pushchair? Is there a review for the Britax B-Agile Double Pushchair? Showing our 5 Britax B-Agile Double Pushchair reviews with an average rating of Excellent. Would you like to write a review? Your Review - Great double buggy that is perfect for my 9month old and nearly 3 year old. So much easier to manoeuvre than my uppababy vista with second seat. Only negative is that I ordered the grey colour and it looks nothing like the photo, it’s a dark grey rather than light. Still very happy with my purchase though. Good value for money vs baby jogger or similar. Your Review - A really good product. Rolls well with a toddler and carrycot for newborn, and folds brilliantly. Recommended for two! Your Review - A great and light double buggy. The Britax B-Agile Double Pushchair is easy to fold and light to push with our 1 year old twins inside, which is exactly what we needed in a double buggy. Our old double buggy was bulky and clumsy so fold but the b-agile double is light to carry from the house to the car and stands up when it's been folded. A great and light double buggy.